When the stables were burnt down on returning from court Confucius said "Was anyone hurt?" He did not ask about the horses. Because of the huge interest in the Confucius family tree there was a project in China to test the DNA of known family members. Kung Te-cheng died in October 2008 and his son Kung Wei-yi the 78th lineal descendant had died in 1989. 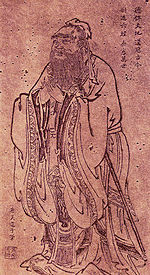 Following the victory of Han over Chu after the collapse of Qin Confucius's thoughts received official sanction and were further developed into a system known as Confucianism. He espoused the well-known principle "Do not do to others what you do not want done to yourself" an early version of the Golden Rule. The philosophy of Confucius emphasized personal and governmental morality correctness of social relationships justice and sincerity.